Due to the nature of this event there will be no rain checks. No refunds. No replacements if lost or stolen. No cameras, camcorders, cellular phones, beeping pagers, radios, ladders, chairs with arms or signs permitted. Holder assumes all risks and danger incidental to the event and the game of golf, including being struck by an errant or misdirected shot, and releases Patty Sheehan and Friends, The Legends Tour, Hidden Valley Country Club, WSGA, JBC Golf Inc, host site, sponsors, host organizations and participating players from all liabilities from such causes. Holder grants permission to the event and The Legends Tour to use the holderâ€™s image or likeness incidental to any print media, live or recorded television or other television transmission or reproduction whole or in part. Holder further agrees not to transmit or indulge in the transmission of any account description, picture or reproduction of this event without permission of The Legends Tour. No rain checks. No refunds. No replacements if lost or stolen. 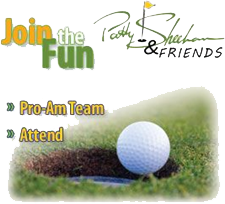 Patty Sheehan and Friends, The Legends Tour, Hidden Valley Country Club will not freely distribute, lease or sell your e-mail address to any third party. Your privacy is important to us. If you wish to unsubscribe from any Legends Tour or Patty Sheehan and Friends communication in the future, you will have the opportunity to do so via a link in the publications. Thank you for supporting Patty Sheehan and Friends and The Legends Tour.